What has 2016 meant to you? No doubt it’s been full of moments of laughter, sadness, joy and challenges. You may have even had a few surprises. More than likely, it has included several accomplishments you can proud of as well.But no matter what, you probably didn’t get everything done that you’d hoped. This is the nature of us ambitious, creative women. We always have more plans waiting on the sidelines. In fact, sometimes our desire to fill our lives SO MUCH can be our own undoing. If we focus too much on what we’re missing out on, we fail to celebrate the beautiful moments right in front of us. Living by this mantra is about choosing what matters most, and committing to it. It’s as much about saying no to what isn’t serving us so we have room to say yes to new things that inspire us. Because, to be present, mindful, and loving to the people who matter most in our life, we must find that creative spark inside us that lights us up. If we try to kindle that flame, amidst holding too many other torches, a light is likely to go out. Too often, it is our own creative passions that we let die out. We sacrifice our own projects and self-care, in service of others.It isn’t easy to hold our own torch up, amidst all the things we are asked to do. Sometimes it can feel like we are drowning in commitments. That’s why I believe so much in the power of creating space for self-reflection and the process of writing down our goals and intentions. 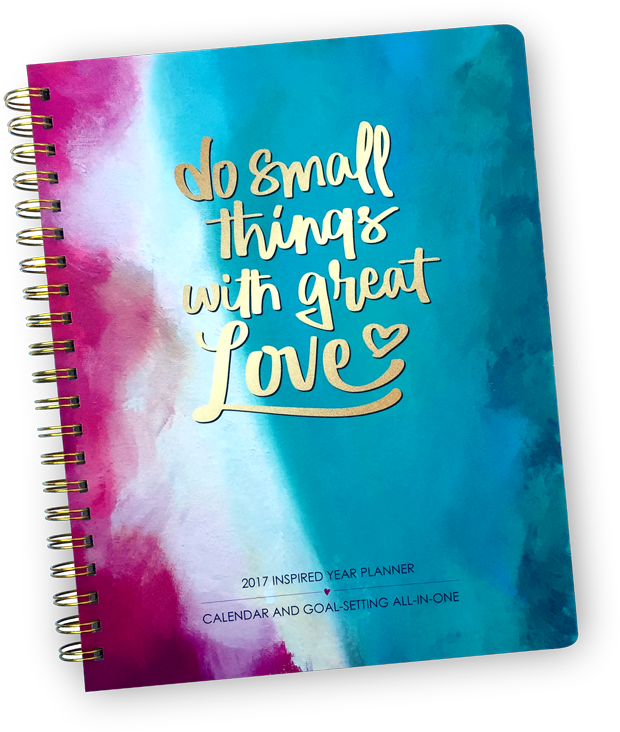 The Inspired Year Planner is all about balance – an indispensable tool for goal-setting, productivity, and creating lives full of happiness and purpose. Balance is about choosing some things to give our deepest attention to, and choosing to say no to other things. Balance is about not ignoring the look in our child’s eyes when work is getting overwhelming. Balance is about surrendering to the downtime we need to stay fueled and inspired. To be balanced, we must pay attention to what we really need and not let the outside rhetoric such as “you must work hard to be useful” or “you must give all your free time to your children” define us. Your story is best told when it comes from the heart. Balance comes from fierce commitment to your own priorities. It also means different things at different times in our lives. Which is why we constantly need to reassess and reprioritize what we need next. How will you create more balance in your life? Don’t let another year slip by while you try to juggle too much. Let this next year be the year you truly make space for all the creative, beautiful ways you want to show up in the world.